Art Walk – with an Indie Craft Fair! 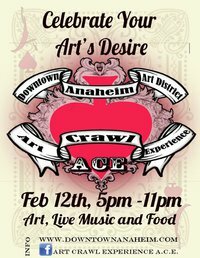 Come Celebrate Your Art’s Desire with Molly Made in Downtown Anaheim! An OC Weekly sponsored event, ACE Art Crawl Experience is an art tour that starts at one side of the Art District and ends at the other. Starting at Downtown Community Center Gallery at 250 Center Street down to Rothick art haus at170 S. Harbor Blvd., Anaheim 92805. Along the way there will be 6 galleries, an Indie Arts and Crafts Fair which will be showcasing local independent artists and designers. Showcasing their unique clothing for both men and women, accessories, housewares, pet items, crochet items, gourmet edibles, photography, jewelry, stationary and paper goods, vintage clothing and more. There will also be a food truck alley, live painting, live music, performers, complimentary refreshments. Sponsored by OC Weekly and Yellow Cab!